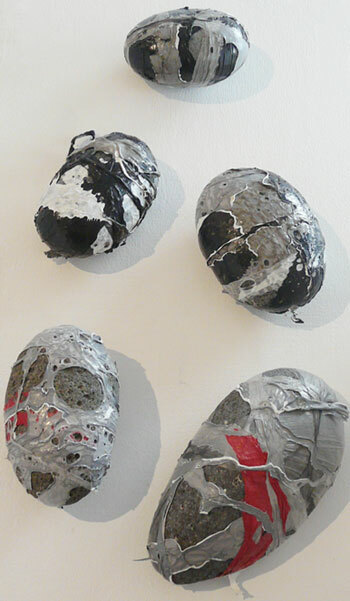 Sarah Lenton’s plastic wrapped stones are a three dimensional composition of greys, black, white and red. “It is not a tale invented but a confirmation of what went on before it…” is a quotation from the Quran (Sura 12, verse 111) which speaks of how everything including religious truths are nothing new: that is, everything is recycled, comes around again. The message is recycled although the materials or cultural lens may differ, and so Meaning boils down to a subjective contexutalized point of view. For decades contemporary artists, have recycled the materials of objects, sometimes with the aim of raising awareness of the effect of context and at other times purely as a medium. Although a recycled item can never be as ‘modernist’ as the medium of oil on canvas or steel or marble because when an object gains a new life in the context of an art institution (whether an established gallery or not) the viewer will immediately notice, for example, that this old shoe is hung vertically and not on someone’s foot. The context of an art gallery would obviously change the aesthetics of the shoe (we might examine it for the colours and textures or for wear and tear). But the viewer might also wonder why are the walls at eye height in an art gallery so important or why do we have the culture of the rectangular stretched canvas? But what about a show that throws light on the theme of rubbish? Where relocated recycled or found objects are invested with values. 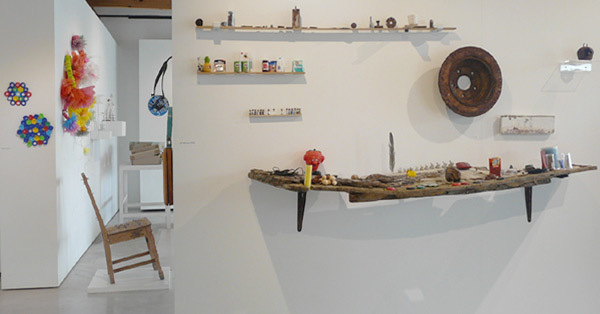 “Rubbish – a new collection” is the latest exhibition at the Kohukohu Village Arts gallery in the Far North of Aotearoa | New Zealand where 29 artists have recycled the material. Artists such as Méret Oppenheim (see her 1936 teacup and spoon made out of fur.) or Pablo Picasso (see his 1942 bicycle seat “Bull’s Head”) have been using ‘found objects’ in their art since the 1920s but in this day and age where we are increasingly aware of the renewability of materials, it is no surprise that many artists choose recycled materials over a blank canvas. A detail of David Stanley Benson’s grid-locked mobiles in the empty spaces of three pieces of unused concrete reinforcing bar and below Sarah Lenton’s plastic wrapped stones. Some choose this for economic reasons. Others for ecological reasons, and some for the conceptual (the extra story or double meaning). Some use the recycled as a medium while other artists use the recycled as part of the message in their work. A detail of David Stanley Benson’s sculpture. 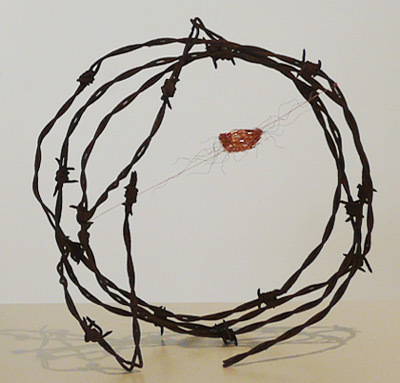 One of three sculptures by Lindsey Davidson in which copper wire is delicately held inside the protection of a barbed wire structure. 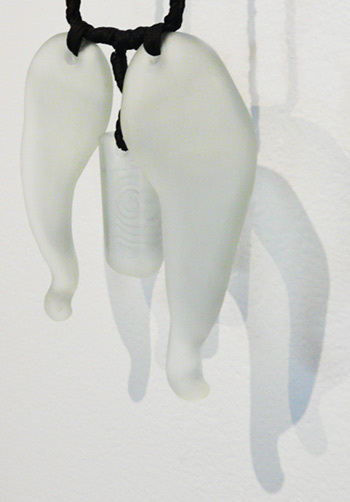 Sarah Lenton’s plastic melted stones function in more abstract terms. They are a three dimensional composition of greys, black, white and red. Lindsey Davidson’s three barbed wire and copper sculptures are poetic spatial inter- ventions. Each copper bundle is surround- ed by a barbed defense system. Perhaps a metaphor for the dependency of the vulnerable elements within an eco-system or the mutability of the systems themselves, given that some of the barbed wire was rusting. While most recycled materials in the show are used as a medium that replaces paint or marble, some, such as in Michelle Mayn’s woven “Recycled Rain Cape / Pākē,” (A pākē = a New Zealand Māori rain cape) bring in the socio-political or the cultural lens. In any other exhibition or context, we wouldn’t notice whether the plastic or wire was recycled or not because what stands out is the delicacy of the form suspended out from the wall and the fine weaving. 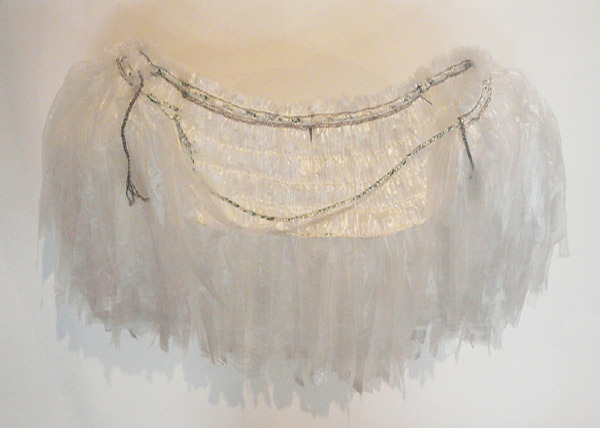 Traditionally pākē (rain capes) were made when needed from leaves found at hand in the bush. By making this pākē from plastic and wire, which are commonly found discarded, she is continuing the legacy of other contemporary New Zealand based weavers who work traditionally with new materials such as Ani O’Neill or Anna Gedson. However Mayn’s work is more sculptural and in this context this work is a statement about how art can change the material. Cold plastic and discarded computer wiring gives form to something soft and protective. 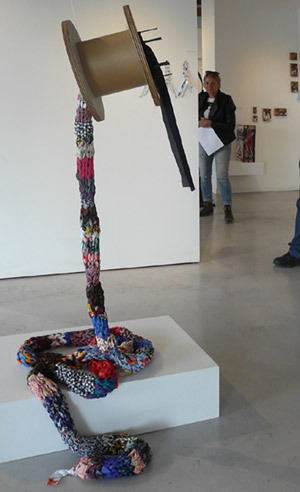 Mayn’s delicately woven sculpture-come-fashion-statement is also a reminder that rubbish is in the eye of the beholder. Tavis Jacques’ pendents also reference the worlds of design and fashion. The material, glass shards, appear sea worn. Washed up glass is not only rubbish but a sign of disregard because at some point it was thrown into the sea by someone. The artist has redeemed the insult. The works display a delicate balance between form (the sculptured and irregular contours as well as minimal traces of what was once a bottle) and design (the forms are almost wing-like and the carved incisions are a double spiral). Rubbish is recontextualised as ornament. 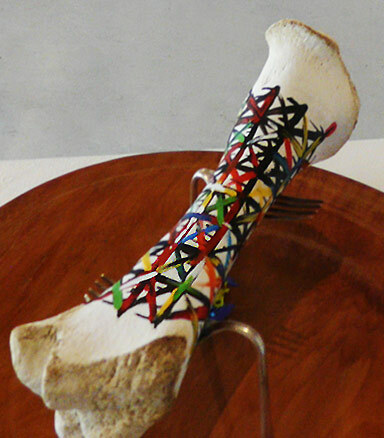 “Down to the bone” by Sue Matthews is as painterly as it is sculptural and conceptual. “Down to the bone” by Sue Matthews is a cross between a Maddox (Allen Maddox (1948-2000) was a New Zealand known abstract expressionist painter) painting and a fluxus object. Matthew’s combination of painting, sculpting and assemblage are akin to the Fluxus use of intermedia. The title refers not just to the bone held up like a trophy above the kauri platter by a pair of forks but also refers to scraping the barrel, using things to the last drop. The paint, her statement informs us, is scrapings from paint tin lids while the platter is a warped reject. Here rubbish is what has been conserved as well as the found or collected objects. There is painterly delight, sculptural magic and conceptual wit in this work. It is an associative work where the edges between one medium or idea merge with another. Perhaps the next time we scrape the leftovers from the plate life gives us, we might think what else can be made of them. The “The Bix-Box Racer” + “The Bix-Box Racer” by Malcolm Ford. Malcolm Ford’s model planes are other works which are a rich combination of the conceptual, the ecological and the material. “The Bix-Box Racer” is a model based on a 1930s single seater 7 cylinder radial plane built for speed. It is made out of weet-bix cereal packaging. Weet-bix was the iconic New Zealand energy breakfast meal for those of us growing up in the 60s to 80s. 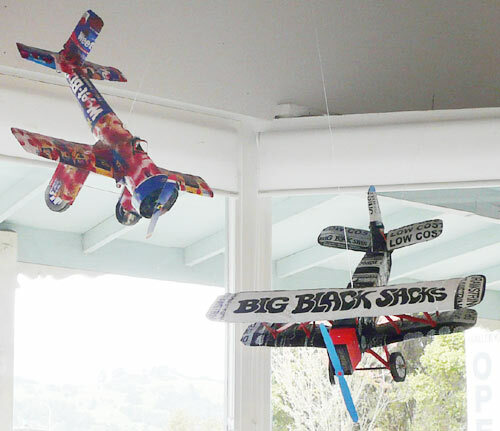 His biplane titled “The Bristol Black Sack,” constructed out of discarded corrugated cardboad covered with a black rubbish collection bag, is based on a combination of the German, French and English biplanes developed towards the end of World War 1. The art of model making is generally concerned with the presentation of a faithful representation aimed at the illusion of a copy of a larger item. In using recycled packaging as well as a rubbish bag, Malcolm Ford has turned this concern with the craft of representation on its head. Then as if this is not enough, he melds the elements of the German, French and English biplanes so the distinctions between those who were at war in the skies of 1918 are dissolved into one art statement. Time does not stand still and we should beware of a nostaglia that is uncritical. In Marg Morrow’s work “Down the Rabbit Hole,” scale is what you notice first. The ‘rabbit hole’ refers to the metre long tube of fabric created by knitting discarded clothing. This Odenburg-esque soft sculpture hangs from an enormous spool that in turn is suspended from above. 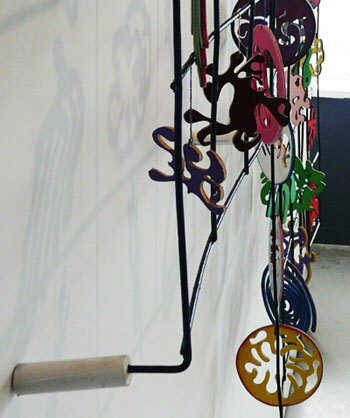 Unlike Oldenburg however, what you notice is the combination of recycled elements. So for example, you can clearly see that the cable spool serves as a scaled up cotton reel. Liz McAuliffe’s approach is to collect, order and display. 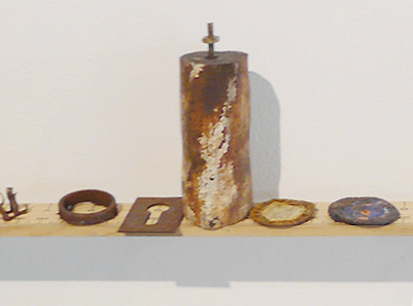 A wall shows her suite of five “Collections.” Three are found objects, such as a wheel hub and a piece of wood, which have been hung like trophies on display. Two of these collections consist of arrangements of objects on shelving. Left > Right: Fused plastic by Sarah Lenton, Wall Flowers by Christine Butler, + Yellow plastic with wire and other objects on the wall are by Lynsie Austin, Chair with metal protusions by Beverley Cox. The objects + shelving on the front wall are “Collections” by Liz McAuliffe. A detail of “Collections: A Measure Of Time” by Liz McAuliffe. In “Collect- ions: A Measure Of Time” objects have been placed at markers along three wooden rulers. The top ruler is dotted arte povera-like with rusted and flattened found objects. Perhaps they mark the passing of time? To me they are reminders of treasures in the unexpected. The second row consists of packaging and the third a row of small bottles. These remind me of Damien Hirst‘s cabinet displays of ordered collections.